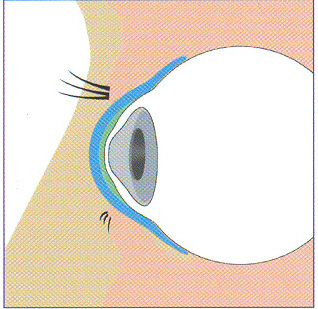 A scleral lens is a hat-shaped lens with an average diameter of 20 mm. The diameter varies according to the diameter of the cornea, as well as the medical indication. Unlike the smaller types of lenses, scleral lenses do not rest on the sensitive cornea, but rather on the external sclera, also known as the white of the eye. The idea is actually very old. The first scleral lens dates from 1888, and scleral lenses have undergone massive development since then; scleral lenses were originally made of glass, but are now made of highly oxygen permeable materials. As a result of modern production techniques and Simone Visser and her team’s continued development of her father’s fitting method for scleral lenses, the lens is successfully used to treat various eye conditions. The result is that the wearers enjoy improved vision, suffer less pain, or suffer less from dry eyes. The scleral lens rests on the external sclera (the white of the eye) and forms a dome over the cornea without touching it. The layer of tear fluid between the lens and the eye keeps dry and painful corneas well-moisturised while wearing the scleral lens. This greatly reduces symptoms—even eliminating them entirely in some cases—while improving the condition of the cornea. Due to their size and firmness, scleral lenses are also often used by the elderly and by people with mobility problems, such as rheumatoid arthritis. 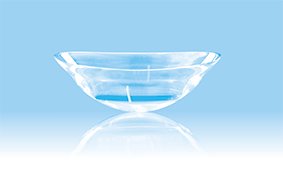 Visser Contact Lenses is at the forefront of the development of scleral lenses, and our founder, Rients Visser Sr., is internationally renowned for his work. As a result, our scleral lens practice sees patients from all over the world. Simone Visser’s PhD research led to the introduction of an entirely new scleral lens design, providing new options for patients who have had a cornea transplant, for example.